Infographic sites that I used, the infographics I created are linked below. ​Fairly easy to learn with templates to start out with. 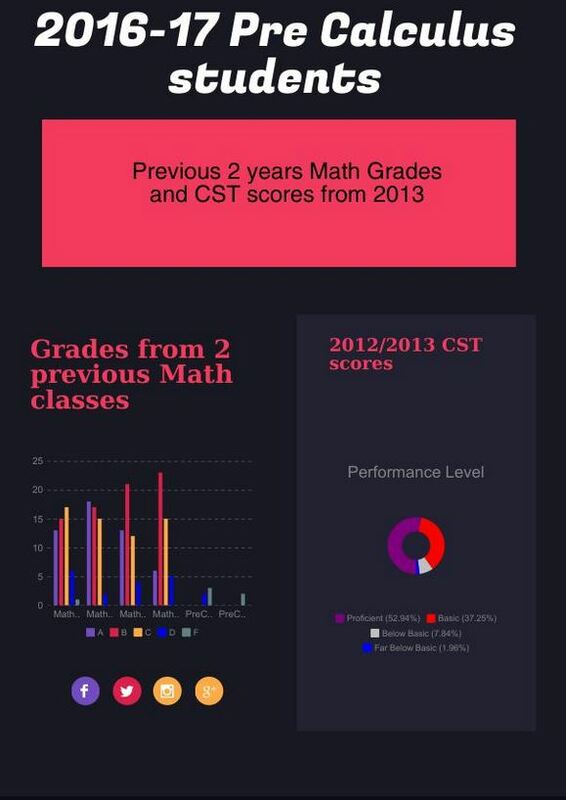 This was my first assignment and I created an Infographic with student data. After studying more about color and alignment, I would certainly edit this one if I were using it. I could not change the size of the infographic- so it is best to use up the whole space, which I did not. The charts were easy to make. Helpful videos to get you started, also with templates that you can edit. Sometimes it is easier to just start fresh but sometime the templates give you a starting point. Extra features for a fee. The free version worked fine for me, but it does not have math formulas or symbols, which makes it less useful for me, but neither did the other programs. This was my favorite, and I am subscribing for a year. They are all pretty similar and have tutorials and help offered. It really is about personal preference. A great read, easy to understand and very applicable to any Visual Design situations. I found I was thinking about it when explaining concepts on the white board, under the document camera, as well as creating visual aids for students.